Wherever you live, these monstrous clear cuts are most likely present. In Hawaii, I’ve noted that the initial causes of deforestation are not so different from those on the mainland. The mass destruction of forests on the island began after Europeans arrived and disregarded the spiritual value of wildlife to the natives by cutting down hundreds of sacred trees to build their homes. 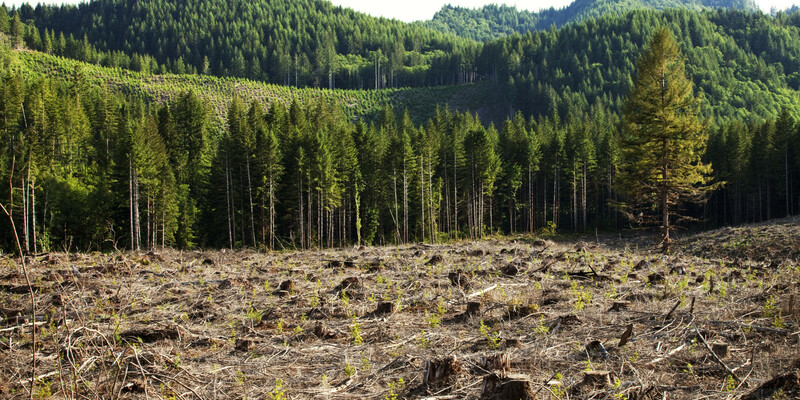 Lumber production is one of the main reasons that deforestation has spread across the world, taking approximately 50 million acres of land each year. That’s why I was not surprised to hear it had an impact in Hawaii as well, although I soon found out that their problems with restoration were not due to clear cutting alone. In Oregon, where I live, animals are not a hazard when it comes to the ecosystem. Because of this fact, it took me a bit longer to recognize what I was seeing when we drove by fields of churned and trashed land. I didn’t understand, that is, until I saw the cows. All this soil that had previously been held together by native trees and birds was now filled with destructive mooing beasts. The cow is not alone though – it is joined by other species that were released into the forests during the 1700’s as game animals for King Kamehameha, gifted by the Europeans. This present proved more detrimental than not, because once set free, the hoofed creatures trampled and gorged through endemic flora, leaving behind a greatly wounded ecosystem. Although cows, boars, and goats were not the root cause of demolishing the forests, they have made the recovery much more difficult. Later, I discovered that the problems were not just limited to lumberjacks and animals. While doing volunteer work at a Waikoloa dry forest, I learned of the slowly disappearing wili wili. These majestic trees have been declining due to a number of reasons, the first being wildfires. Invasive grasses blanket the lava flows, allowing fire to spread easily over hundreds of acres of land. This issue is nearly impossible to avoid now because the non native weeds have grown out of control. Another issue that has been presented to the wili wilis is selfish people. Oftentimes, managers of resorts and wealthy home owners seek out the pleasing aesthetics of this tree, and will sneak into the dry forests to dig them up. In hearing this ludicrous reason, I realized there are probably people out there, or even communities, who remain completely oblivious to the wide scale problem of deforestation. In coming to that conclusion, I’ve realized that something must be done. Whether its simply spreading the word and allowing society to do with it what they will, or instigating a restoration project in my community, I intend to do something to stand up against the injustices brought on by deforestation. Where I’m from, trees are more than just material objects that build houses and furniture. They are shelter against the ever-tormenting rain, they are steps to adventures in the sky, they are magnificent ice sculptures in the snow, they are lodgings for our owl acquaintances, they are all-encompassing, and to me, they are home. There was an instance awhile back where the government wanted to close off and cut down the trees at a small hydro park on the top of our neighborhood hill. But we were not about to give it up – I practically lived in those trees. My family joined with a group of other families and fought to have our little plot of land turned into a park, instead of being closed off to the public. In the end, we won, and I am still able to swing in the branches at what is now called Texas Hydropark. This is the kind of thing that I hope to continue participating in. If another park is ever in jeopardy, I intend to be the first one there, standing up for the right to play in nature. From there I hope to go even further, and work with a volunteer organization like the Lomakatsi Restoration Project, or the Deschutes Collaborative Forest Project, in restoring damaged Oregon forests. I have a feeling that if I ask around, I will find many more members of my community who are willing to join me, even if it means giving up some of their free time. They care about our forests too, and because of this they will be my greatest allies in helping me speak for the trees.